When you pass your 40 week gestation date and you feel comfortable with baby happily hanging out you realize it’s time to cook. We hit single digits for the first time all winter and we didn’t have plans (as we could have been at the hospital) so Ryan and I took our stab at getting ahead for dinners. Yesterday he made our favorite turkey lasagna recipe and today we made chicken tortilla soup to freeze and enjoy post baby T3. Unlike a lot of chicken tortilla soups this one has noodles in it which I thought the kids would love. Two recipes down, one Asian Noodle dish prepped and ready for dinner tonight. Looking for an easy, tasty meal for these cold days? Try one of these recipes. The lasagna is my favorite as it’s easy but still has homemade sauce and great flavor. As for the soup, one spoon in to taste test and it’s yummy! Every September I get anxious to start making soup and fall foods. I love the change of season and all the warm delicious meals. All it takes is the humidity to leave and my kitchen is in soup mode. It’s currently 5:45pm and still 70 degrees out but the nice lake breeze and windows open made it perfect for soup. My amazing girlfriend and past roomie Claire gave me this recipe years ago and it never gets old. I think I’ve shared it 20 times which means it’s time for it to get on my blog. It’s easy, quick and delicious. Somewhat like a pasta fagioli soup but even better. The kids, Ryan and I all love it! Without further ado- here is the recipe! Note: you can easily substitute gluten free noodles to make it gluten free OR use meat substitutes or skip the sausage for a vegetarian fair. Either would easily work. Add 1-2 Tbsp olive oil to pan and cook sausage and onion over medium heat, drain thoroughly. Heat to boiling, reduce heat, cover and simmer 20 minutes. After 6 days of being sick at home this past week I was craving some hot homemade soup. So, between naps, chugging water, coughing and blowing my nose I woke up from a nap with enough energy to do a little chopping for some comfort soup before another nap. I already needed to run to Byerlys in my pajamas to get baby Vick’s Vapor Rub so I picked up a rotisserie chicken. I got home and browsed the 101 healthy soups on Cooking Light and found a base recipe to use: Tuscan Chicken, Bean and Spinach Soup. I say base as I made a ton of modifications to fit what was in my cupboard. 1. Heat dutch oven over medium-high heat, add oil and butter. Let butter melt then add onion, carrots, celery, squash, mushrooms and garlic. 6. Add spinach, let wilt (~3 minutes). 7. Serve in a bowl with sprinkled parmesan cheese on top. You may be wondering if our crop share ended since I haven’t posted in awhile. The answer is no and the reason I hadn’t posted in awhile is the recent shares have been for foods that we often eat raw (carrots, lettuce, arugula, cucumbers) or things like onions and garlic that I add to everything. 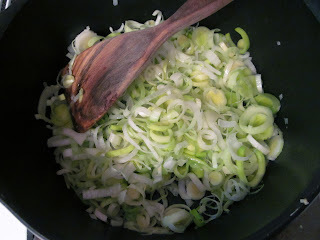 This past weeks share I did receive a few special treats: potatoes and leeks. It was like someone was saying to me “Make potato leek soup.” I have had leeks at restaurants but I’ve never cooked with them before so I was so happy to get them in my crop share to prep on my own. I was also excited when I found a potato leek recipe that called for all ingredients I had at home: Potatoes (check), leeks (check), butter (check), broth (check even though I used chicken), salt, pepper and thyme (check- I used dried) and cream (As you can imagine I didn’t have this but also didn’t plan to use it; skim milk was my substitute). I also didn’t make the cheddar toasts but they do sound amazing and I would recommend trying them if you have time. Notice the burned in “S” on my favorite wooden spoon. My friend Claire’s mom did that by hand! My first time with cooking with leeks was a success. 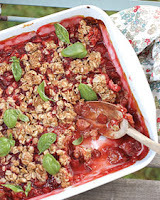 Perfect for a cold fall evening or light meal. Probably good I made it a night my husband wasn’t home for dinner as I don’t think he would have enjoyed it as much. He prefers bold flavors and this was subtle and simple. I’m not sure I would go out of my way to buy the ingredients to make it again unless I was sick and craving a light soup but I would recommend trying it you typically like potato soup or potato leek soup. I’m blessed to have amazing friends and family in my life who love to cook. Ryan and I have been treated to so many delicious meals that I wanted to start featuring some of the other amazing cooks I know on my blog. 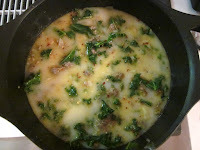 The first installment of my blogs guest cook is Chrissy Keene. Chrissy and I met our sophomore year of college in Park Spring Apartment complex in Madison. We both lived with 4 girls and met Ryan and Sean who lived with three other boys across the hall. She started dating Sean that year and Ryan and I followed the next year. Who would have known that we’d meet our husbands in that building and remain great friends. We are so lucky that they live 10 minutes from us. Chrissy and Sean are both amazing cooks and love to cook together. They throw great parties and always have plenty of fresh, delicious food. They amaze me with their ability to cook without recipes. Sean can marinate the best meat with a random concoction of seasonings and Chrissy always has great vegetable dishes. Below is one of my favorites of hers. 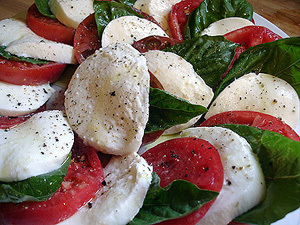 I’m not sure where the recipe is from but it’s a melon, mozzarella salad. This is the perfect example of moderation. The picture shows the prosciutto the most since it’s on top but once the dish is mixed their are fruits, vegetables, nuts and cheese. 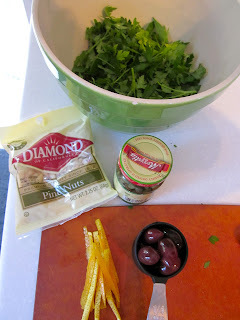 While prosciutto is higher in salt and fat you don’t need to use much of it in a big dish. If you’re like me then you need a little salty cured Italian meat every once in awhile and having it in a salad is the perfect outlet! Chunks of fresh mozzarella, cantaloupe, roasted pine nuts, crisply cooked asparagus and crispy prosciutto crumbles topped with olive oil, lemon juice, salt and pepper. The thermometers in Minneapolis hit record below zero temperatures this week so homemade soup was a must. This soup recipe was given to me by a coworker and originally an Olive Garden soup but I adapted it to be healthier, heartier and in my opinion, more flavorful. I expected it to taste good but was shocked at how amazing it turned out. 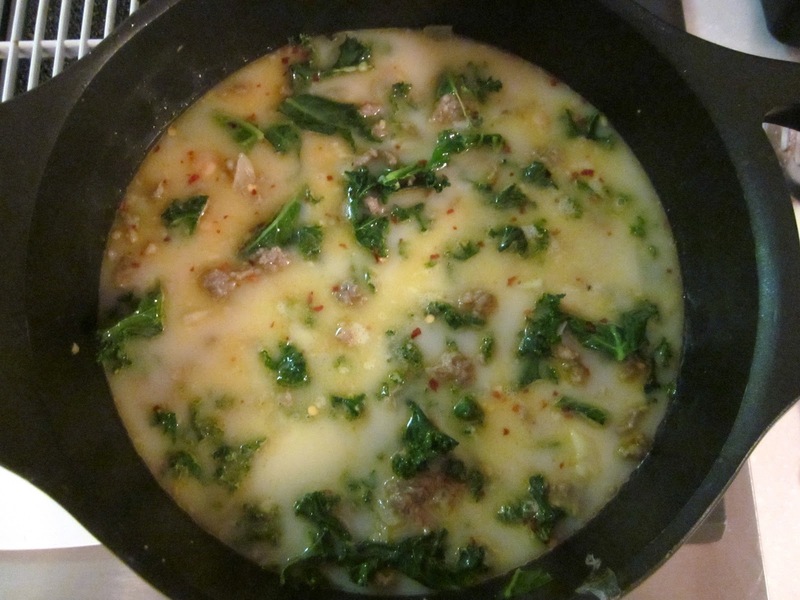 It’s simple yet spicy; hearty yet not too filling; creamy yet not fattening and yes…it contains Kale :). I made it with meat but you could easily make it vegetarian by substituting meatless crumbles. Poke holes in the baked potatoes and microwave them for 6-8 minutes (until tender). Set aside to cool.